The Brooks School’s previous arena was installed with a standard R22 refrigerant system. Several years prior, the arena converted the R22 Freon plant from a water-cooled unit to a dry-condensed, air-cooled plant. Brooks School was pleased with the lack of water treatment and the decrease in issues, which are frequently associated with a water-cooled system. The requirement of a new design would require a dry condensed of cooled system. As the arena was mainly seasonal, there was not a severe energy penalty. 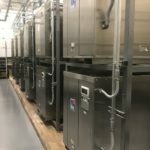 The previous locker room HVAC installation was the result of many years of varied designs all sourced from natural gas boiler systems and some electric reheat strategies. The rink itself had little to no heat at certain times when required to transition into a turf field. Extremely cold indoor temperatures forced the facility to use outdoor air and fans to increase the temperature. The refrigeration room was trapped by a new addition and access to the outdoors was limited, requiring the new plant to be a modular design. Finally, there was a snowmelt pit for ice shavings, but since the first installation, it had not performed correctly and the Zamboni was only able to deposit its shaving load outdoors. Working with Greener U and the Brooks Administration, Preferred Mechanical Services presented a design that used Emerald Environmental Technologies ice3 Cubes as a year-round solution. The reclaim of waste heat from the ice3 Cubes aimed to preheat water, heat locker room ventilation air, produce snowmelt, and warm floors. In addition, it provided heat to the arena in two separate zones, allowing for a cooler temperature over the ice and a separate temperature for the spectators. A new roof-mounted AHU (air handling unit) was installed to act as the primary dehumidification system in accordance with the two existing mechanical dehumidifiers. The AHU conditioned the room and controlled outdoor airflow based on CO2 levels and occupancy. The ice3 Cubes supplying cold glycol to the AHU were also used to air condition the arena during the summer months. The Brooks School facility would finally be equipped to be used as a true multi-use facility. Five ice3 Cubes were installed with capacity of 105 TR, as well as with domestic preheat and reclaimed heat systems. The ice3 Cube’s condenser water loop temperature is maintained by two roof-mounted dry coolers, which are also used for rejection of heat when excess heat is not needed. Heat is reclaimed for the entire facility’s ventilation air. The enlarged snowmelt pit is installed with a coil to conduct the Cubes’ waste heat and eliminate the need for the Zamboni to leave the facility. A large 1,000-gallon cold storage tank is also mounted between the Cubes and the cold floor. Rink to transition into a turf field generated extremely cold indoor temperatures, forcing the facility to use outdoor air and fans to increase the temperature. Use of the ice3 Cube heat backed up by boiler heat and new air handler allowed for controlled temperatures in the arena. The refrigeration room was trapped by a new addition and access to the outdoors was limited. Modular installation allowed for no reconstruction of the building. An existing snowmelt pit for ice shavings had not performed correctly and the Zamboni was only able to deposit its shaving load outdoors. Staff was leery that the pit would work and were ecstatic by the final performance.